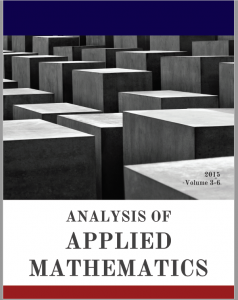 Analysis of Applied Mathematics (AAM) is a journal devoted to the publication of original research papers in applied mathematics for high (secondary) school students. Our mission is to promote academic curiosity in the field of mathematics by encouraging students to produce quality research. Applied mathematics is used throughout industry. Some of the fields that use applied mathematics include engineering, science, medicine, finance, and business. Almost every company in today’s modern society uses some form of applied mathematics, whether it is statistical analysis, capacity and inventory modeling, or market research. When an improvement is needed in academia or industry, research is often conducted in the field of applied mathematics. Certain practical applications also motivate the need for development of new pure mathematical theories. Why Analysis of Applied Mathematics (AAM)? The goal of AAM is to promote curiosity and research in applied mathematics. AAM provides a unique opportunity for high school students to publish a mathematics-based research article in a journal. Students usually do not obtain exposure to writing for academic journals until they are Masters or PhD-level college students. Writing about research takes disciple, focus, and an aptitude to discover new information or ways of thinking. Therefore, publishing in journals and on websites provides exposure, prestige, and publications for your resume and college applications. Most importantly, it will help you to develop expertise and new approaches for solving problems.